Menstrual cramps generally begin after your period has begun and often trigger the desire to binge on sweets in the hopes that the sugar will alleviate the pain. Cravings for chocolate are perhaps the most prevalent desire as it is widely considered to be a comfort food. But contrary to what might seem like a perfect antidote to feelings of discomfort, chocolate actually can aggravate symptoms, making the cramps much worse. Menstrual cramps are caused when the lining of the uterus releases a hormone-like substance called prostaglandin. As prostaglandin is dispensed into the system, it causes the uterus to undergo spasms or contractions, which are from increased production of the substance. It is normal to have mild to moderate cramping at the beginning of menstruation because of prostaglandin's inflammatory effect as well as its influence over the constriction and dilation of blood vessels, which also causes variations in blood pressure. A craving for chocolate during the early menstrual cycle is often because of higher levels of hormones that are triggered as insulin increases. This causes low blood sugar. When blood sugar is low, the brain sends signals to the body that it needs more fuel, which is often a misguided message to eat chocolate and other types of sweets. Instead of chocolate, increasing the intake of complex carbohydrates such as whole grains will help counter fluctuating blood sugar levels, which in turn helps lessen cramps. According to the Food and Drug Administration's Center for Drugs and Biologics, though chocolate contains a small amount of caffeine, it contains large amounts of theobromine, an alkaloid that is classified as a mild stimulant of the central nervous system. Because of this, chocolate can create a nervous condition that actually accentuates pain and discomfort. 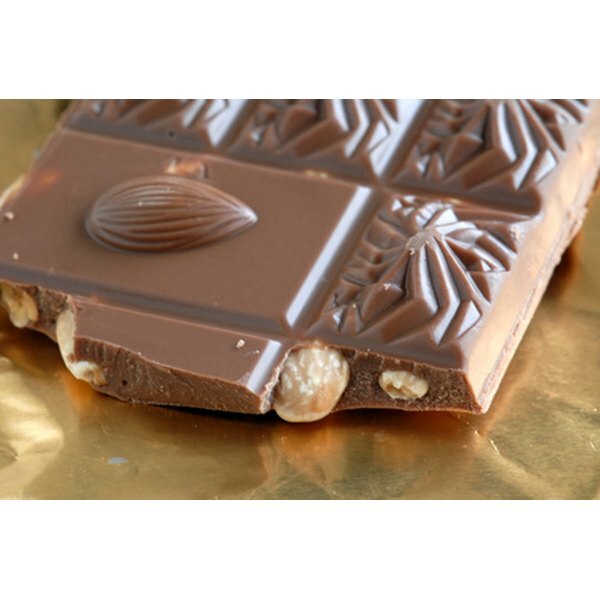 Chocolate is also considered an antidote to menstrual cramp pain because of its calcium content. According to Dr. Susan Link, director of the PMS Self-Help Center in Los Altos, Calif., women using calcium supplements have less cramp pain than those who do not augment their diets with the mineral. In this regard, it is best to take a calcium supplement rather than seeking calcium in chocolate. When combined with magnesium, which helps the body absorb the calcium, menstrual cramps can thus more realistically decrease without the aggravation of the stimulants found in chocolate. Premenstrual syndrome, or PMS, often creates mood swings along with depression, irritability, anxiety, insomnia and other discomforts. PMS can occur up to two weeks before menstruation and is caused by hormonal fluctuations. As with menstrual cramps, chocolate cravings can become heightened during PMS, but it is best to avoid the urge to indulge as chocolate can inflame emotional symptoms because of its caffeine and theobromine content. Fighting the urge for sweets by supplementing them with whole grains along with calcium and magnesium supplements is as essential during PMS as it is throughout the course of menstruation. Does Ice Cream Cause Menstrual Cramps?